The Arabian Peninsula has recently become an exotic and alluring tourist destination for those seeking something a little different. One of the main reasons for travelling to the desert kingdom’s capital Riyadh is for its excellent shopping facilities and bargains on top named brands. Here shoppaholics can experience the thrill of wandering around a completely ultramodern air-conditioned shopping centre or try out the fun of haggling and bartering in the city’s exhilarating, traditional bazaars. The thoroughly modern Saudi Arabian city of Riyadh has some of the most interesting shopping available and you can find almost anything in its vast centres, glittering with gold and brightly coloured decorations. The other appeal of shopping in Saudi Arabia is that goods are zero VAT rated and therefore, much cheaper than you will find in Western shops. Whether you are looking out for the latest in modern technical innovations, designer sports wear or traditional Arabian trinkets, like finely woven carpets and daggers, the shops around the city provide a great selection of opportunities. You can find hundreds of spices and herbs alongside the latest CD releases and there are plenty of places where you can grab a bite to eat and drink a coffee as you shop till you drop. Memlikah Mall located in the Olaya district and has a dedicated women’s floor on the second floor, here only women are allowed to shop and work. This allows for the ladies to remove their traditional abaya if they so please and shop in comfort. They have a great choice in branded labels for clothes and lingerie. It is also the ideal place for a coffee and for ladies to buy their favourite chocolates. 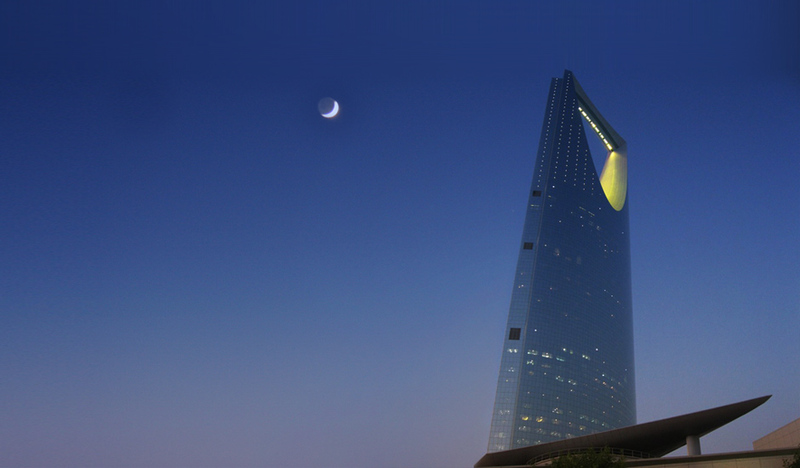 Kingdom Tower is one of the main shopping centres in Riyadh and a famous destination for shopping trips. This ninety-nine-storey shoppers paradise has many leading Western shopping names like Debenhams. This is the mall for all the designer names such as Benetton, Calvin Klein and D&G. The second floor is Ladies Kingdom, a women’s only department store where all the staff are female too. Men in need of a treat or women looking for something special for their husband can try the first floor where they have an array of manly gifts, clothing, shoes and a glitzy array of designer watches. Al Fiasalah Mall also to be found in the Olaya suburb is another of the most popular modern shopping complexes in Riyadh and also contains entertainment facilities and a superbly decorated hotel and apartments. The stores inside are aimed particularly at women and contain many high street designers and well-known brand names. Sahara Mall is one of the largest shopping centres in Riyadh and specialises in fashions, accessories, make-up and shoes, making it a great destination for the ladies. There is also a Safeway grocery store with a fabulous selection of local produce and foodstuffs. Batha district is where you will find the main souq (market bazaar) they tend to be arranged by product so all similar goods are within easy reach of each other and you won’t have to travel far to haggle on the price of similar looking items. Al Owais, Kuwaiti Souk is one of the oldest traditional market areas in the whole of Riyadh and around the narrow alleyways and small stalls you will find a vast collection of goods on sale. This souk has everything from household goods, to jewellery, spices and incense to shoes and fashion items. This is the ideal place to visit if you are looking for the genuine Bedouin market experience, noisy, frenetic and everyone haggling for the best deals.